Stanford Advanced Materials (SAM) offers lithium telluride (Li2Te) powder in various purities with competitive price. Other lithium compounds: Lithium Fluoride (LiF), Lithium Chloride (LiCl), Lithium Niobate (LiNbO3), etc. 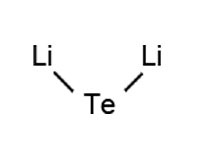 Lithium Telluride (Li2Te) is a crystal grown product generally immediately available in most volumes. Storage condition: Keep container in a well-ventilated and dry place. Lithium telluride powder is primarily used in solar cells and the semiconductor materials. Our lithium telluride powder is clearly tagged and labeled externally to ensure efficient identification and quality control. Great care is taken to avoid any damage which might be caused during storage or transportation.